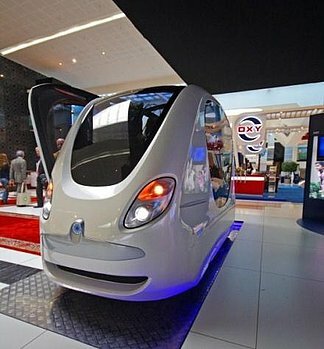 When it comes to the future of transportation, it is clear that clean energy, automated systems and robot cars will all figure pretty prominently in the mix. But how will this effect our system of roadways and travel infrastructure? This is a question that is often raised whenever futuristic concepts for cars and transportation are showcased. Clearly, they deserve to be modernized as well, with something cleaner and smarter taking their place. 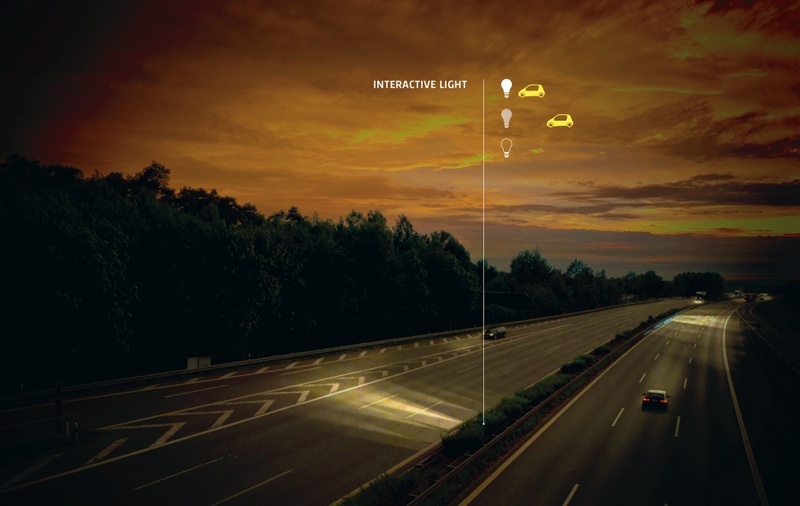 So argues Dutch design firm Studio Roosegaarde, whose ‘smart highway’ concept is set to be unveiled in the Netherlands in 2013. The design involves motion sensors that detect oncoming vehicles and light the way for them, then shut down to reduce energy consumption. 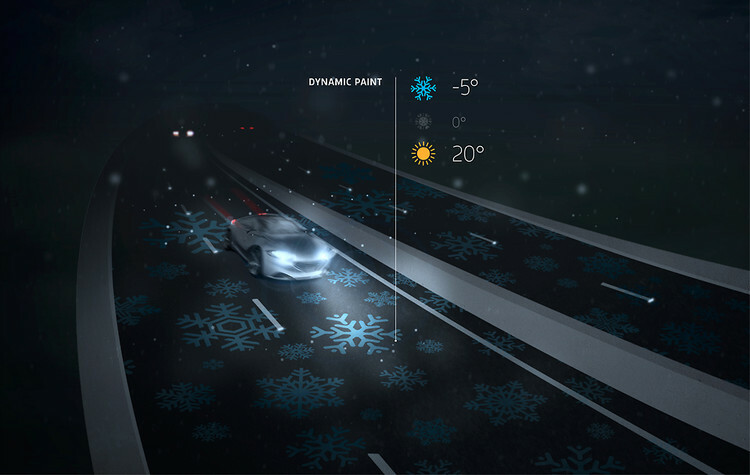 Lane markings will use glow-in-the-dark paint to minimize the need for lighting, and another temperature-sensitive paint will be used to show ice warnings when the surface is unusually cold. The highway also established for priority lanes that will accommodate electrical cars. Studio Roosegard hopes that these will one day l feature induction loops buried beneath the tarmac, which will allow electric car owners to literally charge their cars as they drive. 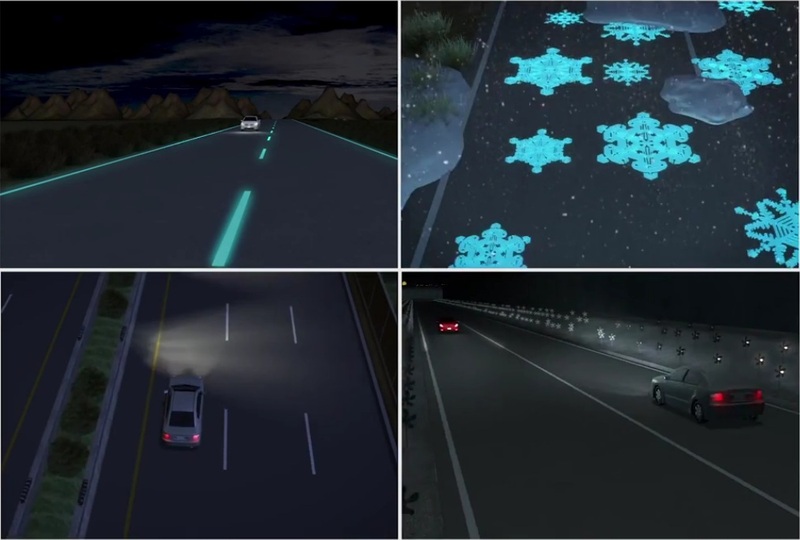 While this concept is not-yet cost effective, the motion sensors and luminescent lane markers will be field tested next year along a 200 meter section of road. The addition of these features along major highways is expected to reduce incidents of accidents, as well as save energy costs by reducing the reliance on streetlights. In addition, the road markings are expected to have longer-term applications, such as being integrated into a robot vehicle’s intelligent monitoring systems. As automated systems and internal computers become more common, smart highways and smart cars are likely to become integrated through their shared systems. Not only will they light the way, but they will update geo-databases, informing us of traffic accidents, for example. What’s more, drivers may even have the option of extricating themselves from the driving process and allowing a “self-drive” or autopilot feature to take over, where the vehicle will link up to the highways own navigation charts and find the optimal route to a destination. And, hold on to your hats, this could also become part of a national “drive safe” campaign, where driver’s are required to turn on the autodrive feature if they are past the legal blood-alcohol limit. In short, smart highways are a proposal that only embraces clean energy and seeks to increase road safety, but seeks to integrate our roadways with emerging transportation technology. It will be very interesting to see what comes of this, especially when you consider the appeal of light rail and self-driving pod cars. For all we know, the future could consist of entirely automated transportation where no one drives anymore and traffic accidents are a thing of the past. I guess the local DPW crew won’t be patching that highway with a shovel and a bucket! Lady Dark Angel, must I tell you that you can’t use American acronyms and expect me to follow? Luckily, Google tells me this means Department of Public Works. And my guess is they will be using buckets, shovels and hot gravel for a few years yet. Civil servants, what can you say? When will this be going in? The company has a test run with a 200 meter stretch of highway this year. As for full-scale adoption, we’re talking a few years time, at least. In OUR lifetime? I would say yes. In fact, I would say that by the time of our retirement, smarthighways will be all the rage!